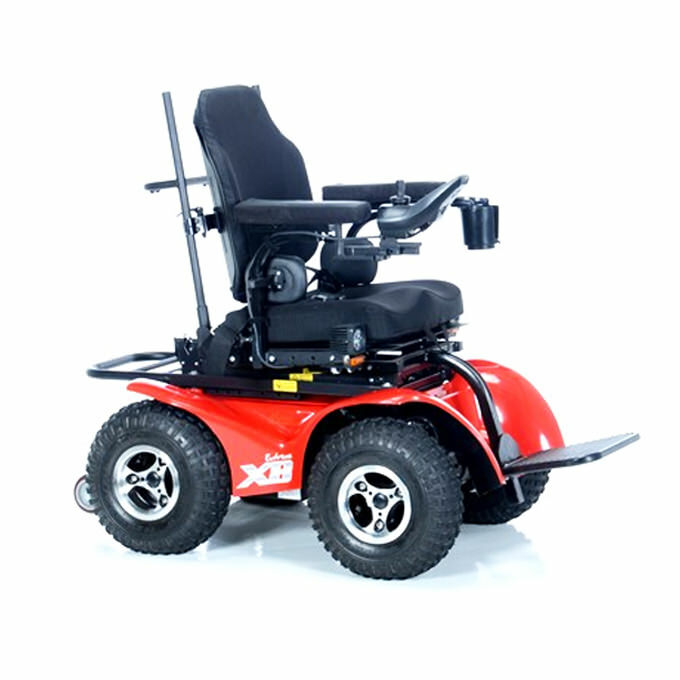 Magic Mobility X8 Extreme 4 x 4 power wheelchair is not ordinary power wheelchair. 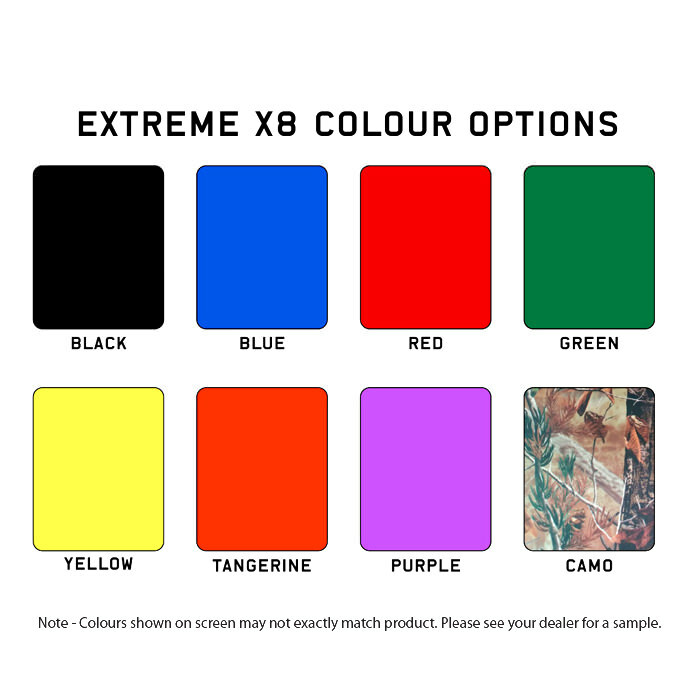 Locations previously unavailable to other wheelchairs are now available to the drivers of the Extreme X8 Wheelchair. X8 Extreme 4 x 4 power wheelchair has a fully integrated power seating system which includes a 12" seat elevator, 50° tilt-in-space, non-shearing recline, and single piece power elevating leg rest. 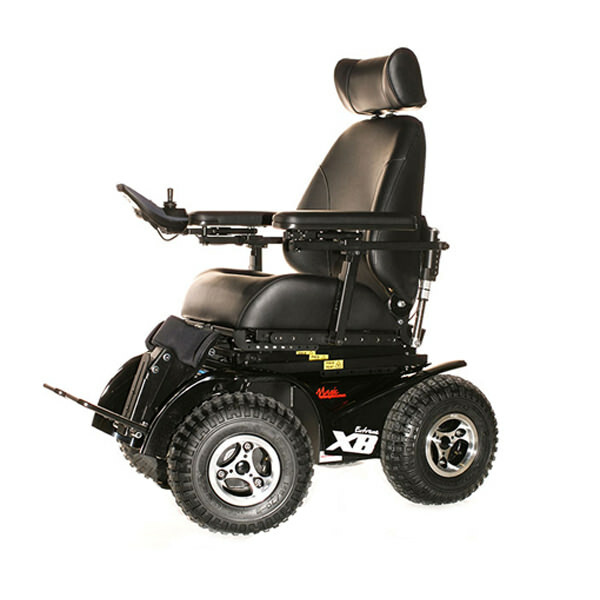 X8 Extreme wheelchair features one of the lightest power seating systems available in the market and can be equipped with either an MPS seat, MPS seat back with solid seat pan, or full rehab seating. 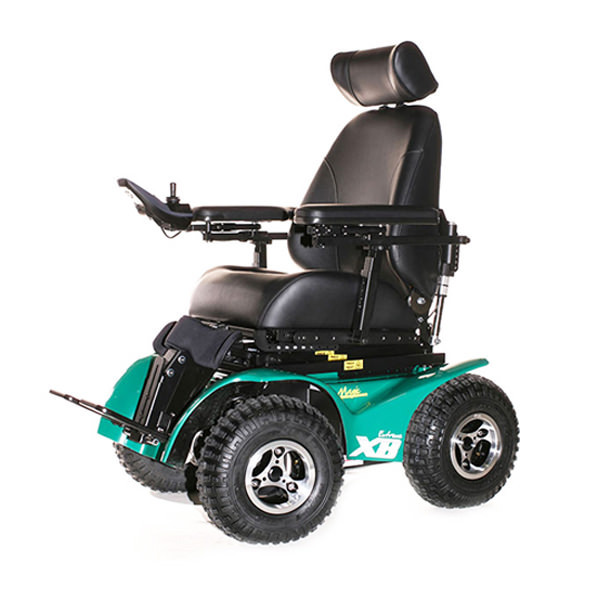 Floor to seat height MPS: 20" Rehab: 19"
Seat depth 16", 18", 20"
Seat width 16", 18", 20", 22", 24"
Backrest height MPS without headrest: 22" Rehab: 18"
Armrest height 7" - 12.5"
Weight including batteries 248 lbs. Maximum user weight 400 lbs. This wheelchair is provided with a 3 years limited warranty on frame. 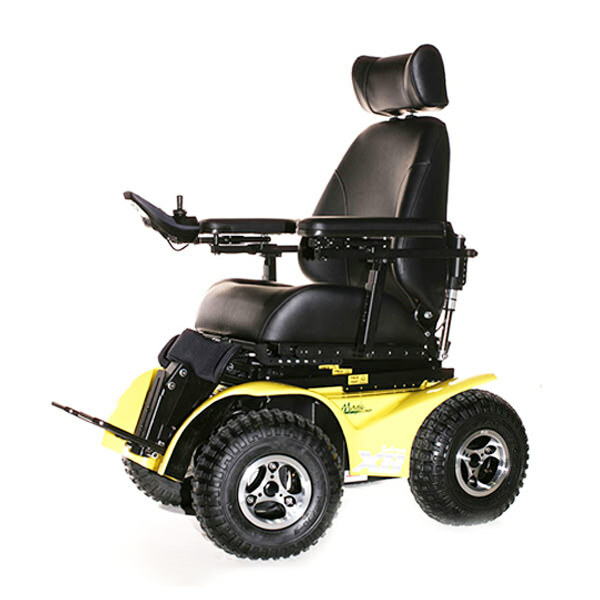 This wheelchair is provided with a 12 month limited warranty on the parts and workmanship contained within. The warranty does not cover freight to or from the manufacturer, that is, the chair must be returned to the factory or Dealer, freight pre-paid, for all warranty repairs. 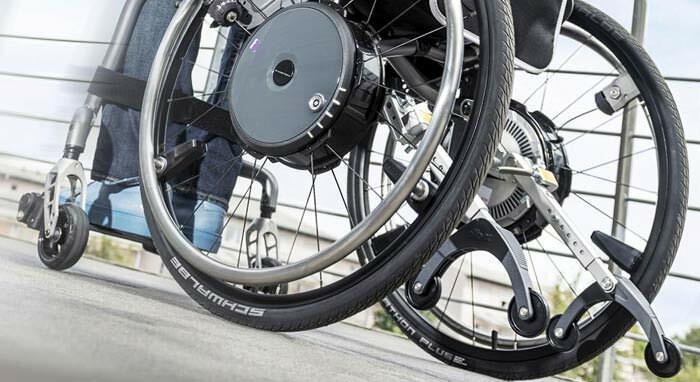 The warranty on this power chair does not cover breakages /damage to either the motors, gearboxes, or axle shafts caused by misuse of the wheelchair. Warranty does not cover faults, failures or excessive wear caused by lack of appropriate maintenance and regular servicing by authorized repairers. Manufacturer will, at our discretion, repair / replace items that we consider were faulty at time of manufacture. 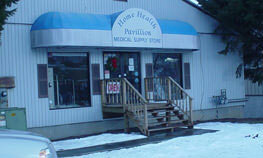 The availability of replacement units is subject to the discretion of the provider, not the manufacturer. All items must be inspected upon receiving. If damage is observed at the time of delivery contact manufacturer immediately, all damage must be documented upon delivery receipt. In the case of concealed damage, photos of product and original packaging must be supplied to manufacturer for the purpose of filing a freight claim with the carrier. 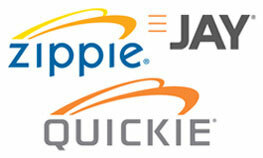 It is the responsibility of the customer to make pre-paid return arrangements to manufacturer. If a product is returned in packaging other than its original packaging an automatic 10% restock fee will be applied. All returned products must be in new and unused condition to avoid additional restock fees. Restock fees will not be determined until the unit has been returned and inspected by manufacturer. 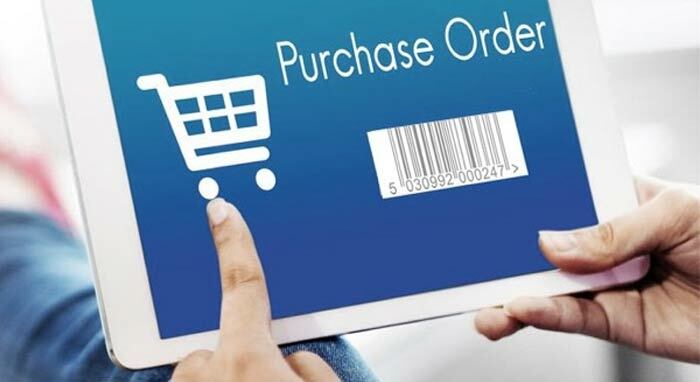 In the event you receive product other than what was ordered, manufacturer must be notified within 15 days, failure to notify could result in restock fees. Replacement parts/product will not be shipped until photo documentation, to verify that the incorrect parts were received is obtained, or the original unit is returned in new and unused condition.